Naqoura (Arabic: , الناقورة Enn Nâqoura, Naqoura, An Nāqūrah) is a small city in southern Lebanon. 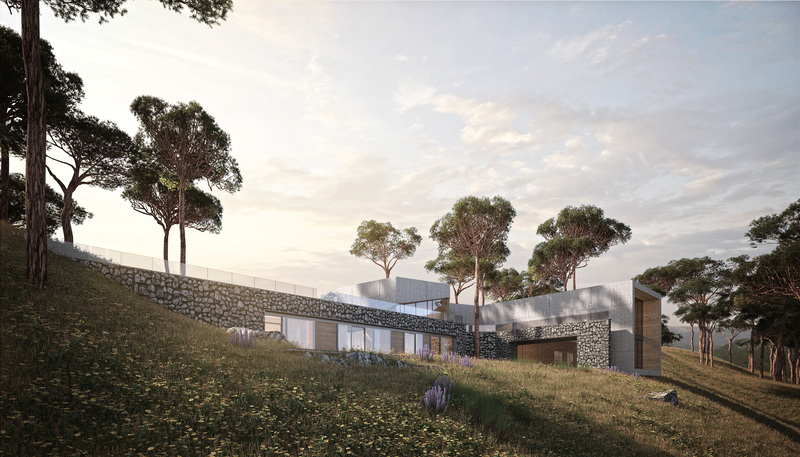 Wedge – A House on the Edge While some architects usually avoid working with difficult terrains, others choose this challenge. 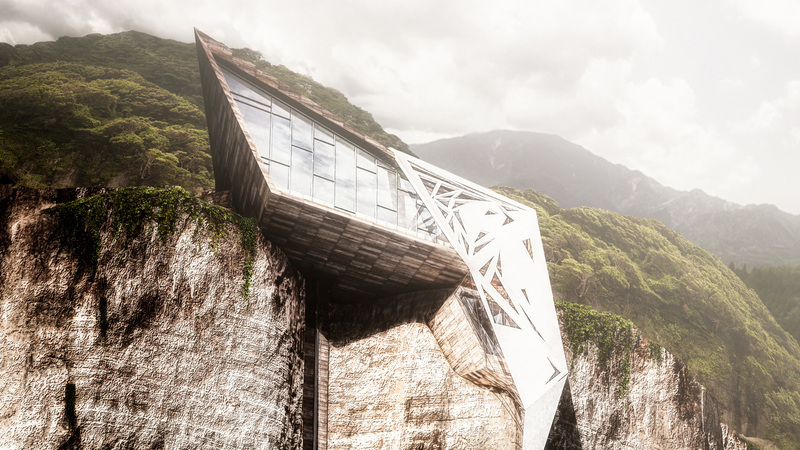 Schema seven set out a new concept design of a splendid futuristic house on a very steep cliff. The future house might be constructed on the rocky area named Al-Bayada on Tyre Sea shore. 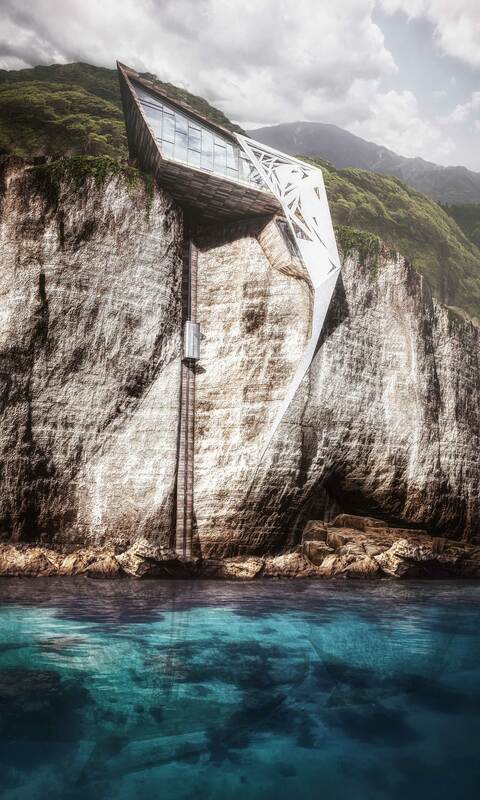 Living in the designed house- hanging above the cliff- fits daring and adventurer residents. 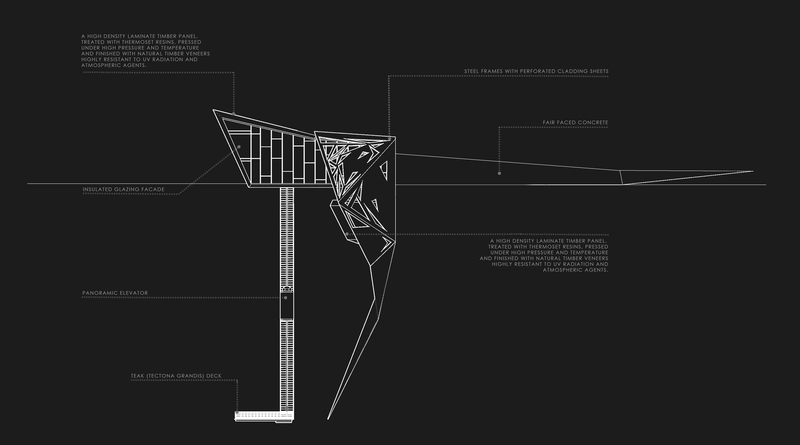 The project titled “The Wedge”. The project is “A youth dream to have a single house on the virgin sea shore of Tyre City. We came up with the idea 4 years ago upon our first visit to the rocky cliff of Al-Bayada”.” The catchy natural beauty and purity of that area, along with the ancient history of the city have urged our imagination. Later, we started planning a design for the future home with a creative and expressive style”. The term “Wedge” means a piece of material such as wood fixed to a ground or wall to support a fence, or tighten a home, or marking certain points in a land survey. “Wedge” also could mean a weapon with sharpened edge. 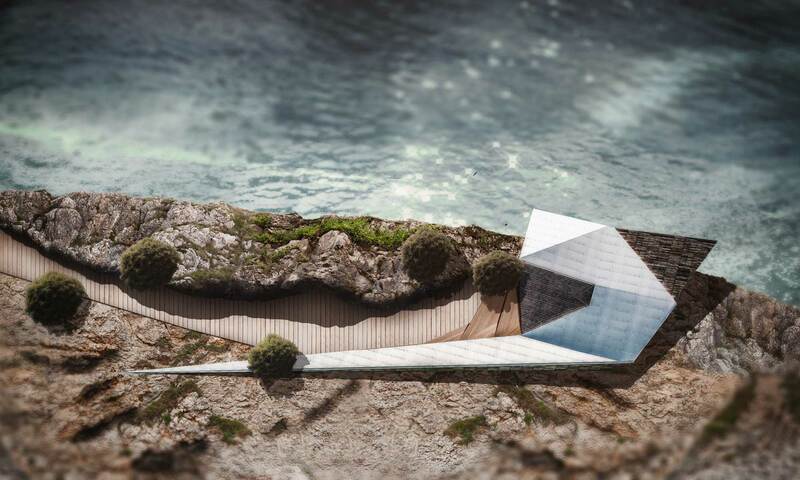 The future designed home is located beneath Palestinian boundaries on Tyre’s shore- the city that was the birthplace of Phoenician journeys spreading alphabetic to the world. Moreover, the shape and expansion of the home assemble that of the purple shells plentiful found on the area’s shores. Architecturally, the modern design allows its residents to interact with the great charm views of the Mediterranean Sea. The house is simple and glass-fronted facing the sea. The ground front part of the house contains a living room and small kitchen; the bedrooms are designed in the first floor. A workshop for activities hangs from the main block of the house and both are connected to the shore with an elevator along the cliff. We focused on the utmost exploitation of natural lighting through glass windows permitting the access of as much as possible of sunshine. The interior design of the house reflects its contemporary style dominated with white color to be more comfortable and blend with the dark natural woody floor”. Overall, the house looks like a fascinating masterpiece. Schema Seven intends through this project to promote new vital ideas. Architecturally, it calls for building relationship with nature through creative designs and consider it a wealth that to be preserved. Architectural style: wedge house is an example of origamic architecture, a composition of folded faces. It is a transformation of the natural organic shape “the rocks of the cliff ” to a geometric form, however it reserves the rough spirit of the original form. 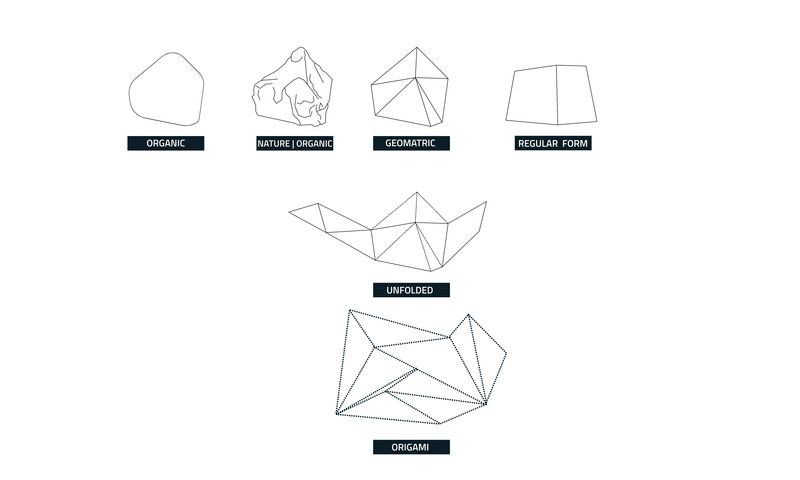 origamic architecture involves: the three-dimensional reproduction of architecture, geometric patterns, everyday objects, or other images on various scales by cutting folded papers (usually a thin paper board) out. gray walls that enhance the steely look. The designed area is about 200 m2 distributed over 3 levels: A ground level, a mezzanine and an embedded bedroom. The entrance in the ground level floor leads to the reception room, dining room, and a small kitchen connected to the family living room in the mezzanine level. the bedroom is a detached capsule embedded inside the cliff, a L shape stair leads down to the room between the cracks of the cliff. 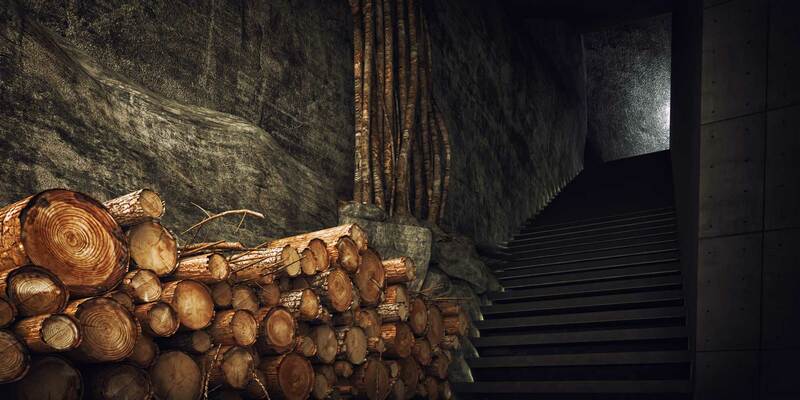 the indirect light with rocks and the materials are used to create a dramatic ambiance. 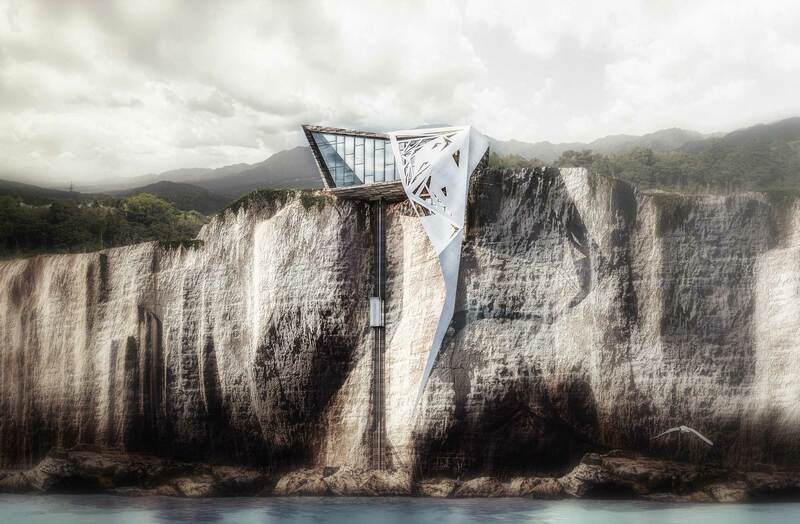 the designer relates the house with the rocky shore by a dramatic panoramic lift. Yet, the journey down to the shore is a big adventure. cliff rocks are a part of the design, we used shiny and soft materials to create contrast with the roughness of the rock. the large glass opening provides visual interaction between the brilliant external environment and the warm interior space, the bath tub is near the opening, you can take a restful bath while you are overlooking at the sea and the cliff with full privacy. Renewable energy is a concern in wedge house. 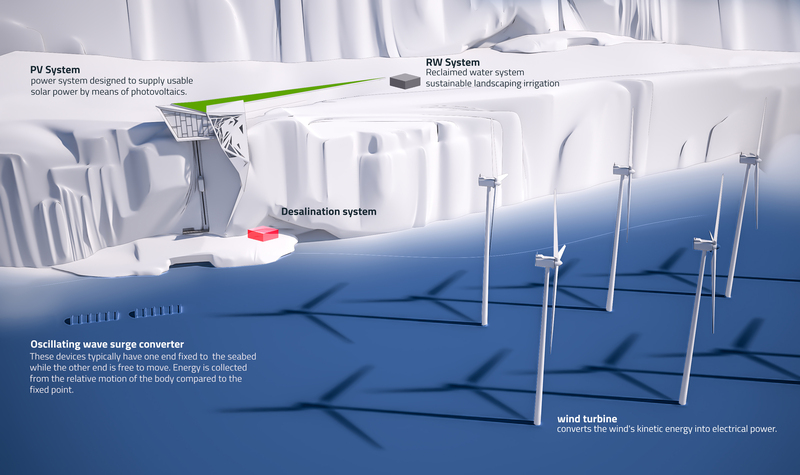 It generates power through some solar panels fixed on the roof as well as the tail that extends horizontally above the cliff. we can also generate electricity from the distributed wind turbines in the sea, where Naqoura village has an active wind all over the year.  the house’s declined roof helps in gathering rainwater for later use. Water is also provided through a water purification system attached at the end of the tail.